The Victorian Era ranges from 1837-1901 and signifies the period during which Britain was under the rule of Queen Victoria. The Victorian Era was a positive and happy period during which the people were enamored with their young and beautiful Queen – this positivity is reflected within the peace and prosperity of the Era itself. The Victorian Era is historically broken up into three periods: The Romantic Period, the Grand Period, and the Late Period. The Romantic Period of the Victorian Era marks the first third of the Queens rule. This Period reflects the attitude of Britain toward Queen Victoria’s love for King Albert. The Grand Period starts in 1860 and is marked by the death of King Albert – this somber period of the Victorian Era is reflected by the rise of dark jewels like the black onyx. Finally, the Late Period – the Late Period bring forward an image and hope for a positive future and brings the Victorian Era out of its somber state. The Victorian Era is also highly characterized by its influence on jewelry. Prior to the Victorian Era, jewelry was primary hand made by artisans who devoted numerous hours of labor to complete a simple piece – as a result, quality pieces of jewelry were harder to come by and generally expensive. The Victorian Era, however, saw a change in jewelry production with the Industrial Revolution. The Industrial Revolution brought forth the tools and machinery needed to mass produce fine jewelry, making it less expensive and easier to attain to members of the lower class. Speaking of class systems, the Victorian Era and the Industrial Revolution brought forth something else that we’re all familiar with today – the birth of the Middle Class. With the rise of machinery and mass production, the Victorian Era saw a rise in job availability, and thus, created a sector of people that weren’t considered lower-class but also weren’t to the status of nobility. Jewelry during the Victorian Era experienced several breakthroughs of its own. The first jewelry breakthrough of the Victorian Era was gold. While gold was a historically popular choice, the dwindling availability of the precious metal created a hike in its cost which resulted in the popularity of gold-plating techniques with which we’re still familiar with today. 1849 brought the world a breakthrough in the dwindling status of gold with the California Gold Rush! The Gold Rush created a surplus of gold, which resulted in an array of Victorian jewelry beautiful crafted in 18k gold. The period between 1866 and 1867 is also a significant one during the Victorian Era – this is the period during which a young teen named Erasmus Jacobs uncovered a clear stone while enjoying the afternoon in his yard. This single discovery shortly uncovered and opened diamond mines in Africa, creating a higher popularity of, and demand for, the stone on jewelry. The popular styles of jewelry during the Victorian Era range throughout its course. The Romantic Period, for example, called for gold pieces decorated with demure gemstones – this period was a good one for pearls. In contrast, the somber attitude of the Grand period called for equally dark stones – several favorites of the time were Black Onyx and Amethyst. Much like the Georgian Era, the most popular pieces of the Grand Period were mourning pieces, marking the memory of loved ones who have passed. As previously stated, the Late Period saw a resurgence of happiness – this overall attitude is reflected in the rejuvenating jewelry of the time. The Late Period saw a rise in jewelry shaped in multi-cultural representations of wealth and prosperity: dragons, doves, crescent and snakes. The snake itself was a popular jewelry theme of the Victorian Era. 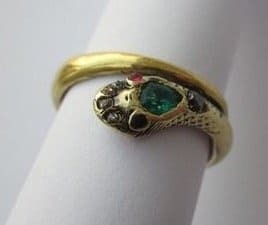 When proposing to his beloved queen in 1840, King Albert gifted her with a ring in the shape of a snake with an emerald head. 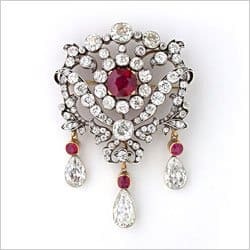 This piece of jewelry is perhaps most significant to its time and best represents the jewelry history of the era. The Victorian Era is when we first see white as a popular hue for a wedding gown – also a direct result of the color chosen by Queen Victoria for her own gown. In fact, the Victorian Era wedding was a primarily white event during which the flowers were white, the décor was white, and even the bridesmaids dresses were white! Though they were white, the Victorian Era bridesmaids dresses were also made to be practical because, unlike today, these dresses would later become an everyday piece of the bridesmaid’s wardrobe. The Victorian Era engagement was to be taken very seriously. During the period of engagement, a young man and young woman were not to be left alone and required the constant shadow of a chaperone. The engagement itself was considered to be so special that, rather than being a joyous moment in time, it was planned out to be an entire days event! While Queen Victoria’s snake ring was a popular choice for an engagement ring, many believed that simplicity was the best style due its symbolism of high moral character. Solitaire engagement rings were very popular during the Victorian Era, often in diamond or a subtly colored stone. While most stones were acceptable as proper engagement rings, one wasn’t: the pearl. During the Victorian Era, the pearl was considered to be symbolic of the bride’s tear, and thus, a bad omen. Though stunning, authentic Victorian Era rings are hard to come by today. Towards the end of the Victorian Era, many jewelers began to make replicas of rings that were popular during the Romantic Period – as a result, there are replicas of the Victorian Era that were made during the Victorian Era, how confusing! To make matters worse, jewelry from the Victorian Era doesn’t possess any hallmarks that would be useful to help authenticate it. 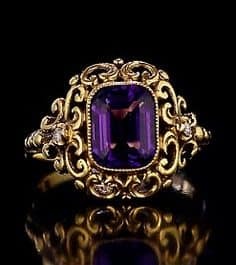 As a result, if you are in the market for an authentic Victorian Era ring, it is best to purchase one from a reputable jeweler that specializes in collector and antique pieces of jewelry.